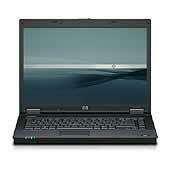 The HP Compaq 8510w Mobile Workstation gives you exceptional computational and visualization performance in a powerful yet portable 15.4-inch diagonal widescreen notebook weighing just 6.1 lbs and as thin as 1.1 in. • OpenGL, DirectX10, and Dual Link DVI (when docked) support deliver faster rendering and support ultra-high resolution displays. Blu-ray Drive plays high-definition (HD) content or stores up to 50GB on a dual-layer disc. • Run demanding applications with true 64-bit computing and support for up to 4 GB of memory. Intel Centrino Pro processor technology helps reduce the TCO of your PCs with built-in remote manageability and proactive security. • Workstation ISV certifications ensure reliable use of demanding applications. HP Performance Tuning Framework (PTF) provides custom workstation setup to better meet your requirements and increases select application performance. • Our focused innovations help mitigate risk with Drive Encryption for HP ProtectTools, increase productivity with HP QuickLook*, enhance reliability with HP DuraKeys, and improve connectivity with HP Broadband Wireless. This page is part of GeneralManual.Com Network HP Compaq 8510w Mobile Workstation User Manual.